« Jensen 541 Cracked Heads | Replace Or Repair ? Jensen FF 119/029 was originally sold to the merchant banker, Peter Samuel. By the early 1980s, the car had fallen into disrepair, and was believed to have been scrapped. When Museum curator, Ulric Woodhams, was told 119/029 was still in existence, there was concern this was a case of switched identity. The Museum unravels the history & mystery of 119/029. 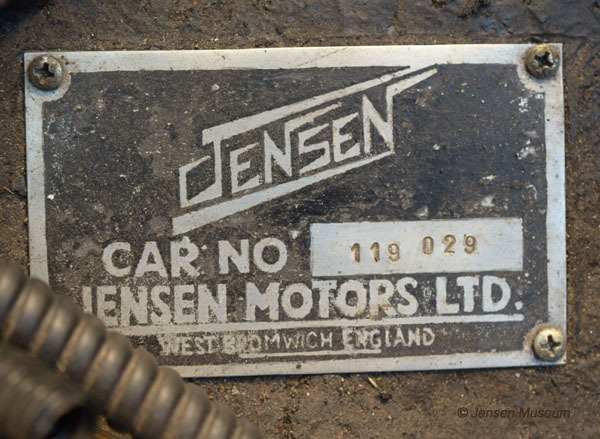 The History & Mystery of Jensen FF chassis number 119/029. At the beginning of the 20th century, the Samuel family had become famous as merchant bankers and industrialists. The family created ‘Shell Transport & Trading’ – one of a handful of companies that dominated the industry. The success and phenomenal growth of ‘Shell Transport & Trading’ can be directly attributed to the fact, that behind the company, they had there own private merchant bank, ‘M.Samuel’, that had been founded by Sir Marcus Samuel. During the first decade of the 20th Century, Sir Marcus purchased 14 acres of Mayfair. The land remained in Sir Samuel’s ownership, and was locked into a company set up for that purpose, ‘Samuel Estates Ltd’. 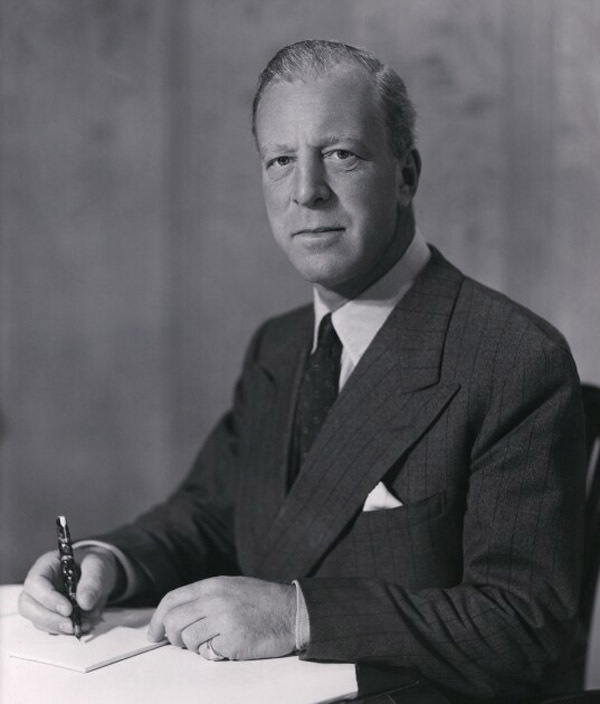 Peter Monteflore Samuel was born on the 9th December 1911, he would later take over the running of his father’s companies and would inherit the title of Viscount Bearsted that had been given to his father in 1925. In March 1936, Samuel was commissioned into the Warwickshire Yeomanry. As war started in 1939, Samuel married Deirdre du Barry, but this wasn’t to last and was dissolved in 1942. He served throughout World War II, and was awarded the Military Cross for bravery in action, as an Acting Major. After the war had ended, Samuel re-married in 1946 to the Hon. Elizabeth Adelaide, the daughter of Baron Cohen. The Samuel family had long been involved with various medical charities, which included Governor of St.Mary’s Hospital Paddington, The Bearsted Memorial Hospital and the Home & Hospital for Jewish Incurables. As Peter Samuel took over the running of the family businesses, he continued to maintain an interest in these charities. Meanwhile on the business front, ’M.Samuel Ltd’ had been floated on the stock exchange during 1960, and later merged with Hill in 1965 to become ‘Hill, Samuel & Co’. Samuel had purchased Bentleys up until the time that the Jensen 541 came out. This model pleased Peter Samuel, and he made an initial purchase of a 541. Samuel continued to purchase Jensen cars approximately every two to three years up until the time that Jensen Motors Ltd went out of business. By 1967, it was time to give a four-wheel-drive Jensen FF a try. One was placed on order with Charles Follett in London at a total coat of £5,346. 12. 5. The car, finished with a specification of crystal blue paint, and black leather trim, was delivered to Charles Follett, Mayfair on the 21st December 1967. Samuel’s personal chauffeur Mr. Phillips, collected the car shortly afterwards. To date it hasn’t been possible to ascertain how long Samuel owned 119/029, or its history throughout the 1970s, in all probability the FF was disposed of after the usual two or three year period. This is a period of the car’s history the Museum would like to find out more about. By 1982, 119/029 had been acquired by Gary Butler, a young car dealer from Earlsfield, South London. 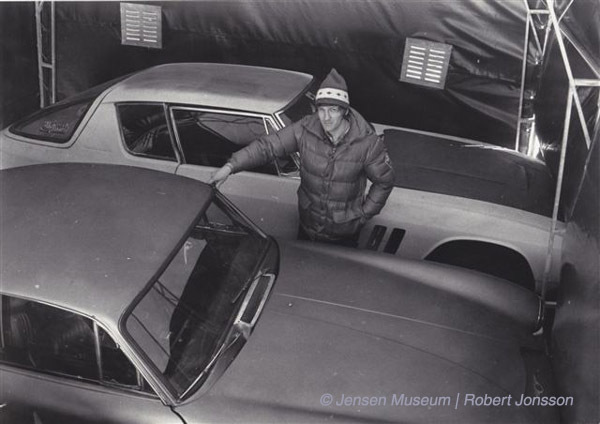 He was purchasing Jensen FF cars for a Swedish contact, Sten Jonsson. Initially, Jonsson, was coming to the UK, buying a couple of cars and selling them back in Sweden. However, as his buying of Jensen cars became more commonplace, he came up with a cunning plan to evade importation costs. Once a car was in Sweden with import taxes paid, Jonsson would remove the chassis plates. He would then bring them to the UK on his next buying trip, and change them onto one of the Jensen cars he was buying. When he returned to Sweden with the new car, he would simply say he was bringing the car back, and that import taxes had been previously paid. The first test car went without a hitch. Knowing this simple plan could work, Jonsson continued to change-over chassis plates on a larger scale. The problem was, once all the cars were in Sweden, he never bothered to change them back again. 119/029 had been re-sprayed yellow by the time Jonsson came to view it. The car, which was up for sale at £1,250 was in poor condition, with rust infecting almost all the lower panels. 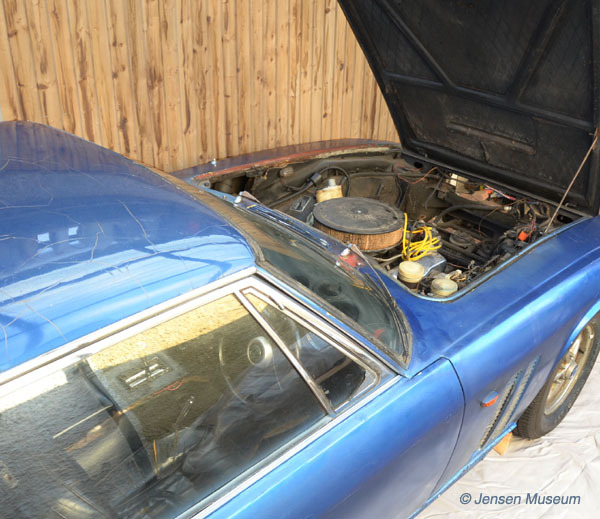 Two other Jensen FF cars, numbers 119/020, and 119/185, were for sale at the same time. 119/185 was sold to a buyer in the UK, and Jonsson purchased 119/020 and 119/029, taking both cars back to Sweden. True to form, Jonsson returned to England with the chassis plates from 119/020 and 119/029. The 119/020 chassis plates were put on another Jensen FF, 119/156. 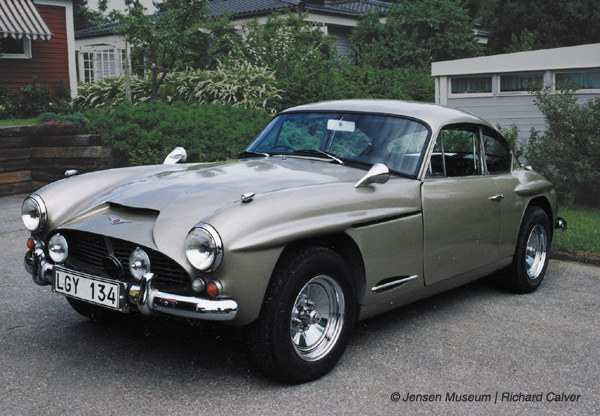 However, on this occasion Jonsson also purchased a Jensen 541S, far from being the same model, but who would notice. The chassis plates of the 541S were removed and replaced with those of 119/029, along with a change of registration plates. Jonsson returned to Sweden. Sten Jonsson beside the Jensen 541S masquerading as 119/029. It is believed the Jensen FF behind him is 119/021. Once in Sweden, the 541S was registered as 119/029, and remained on the 119/029 chassis plates until 1998. The 541S masquerading as 119/029. The car was inspected and photographed by Jensen historian, Richard Calver, during 1995. 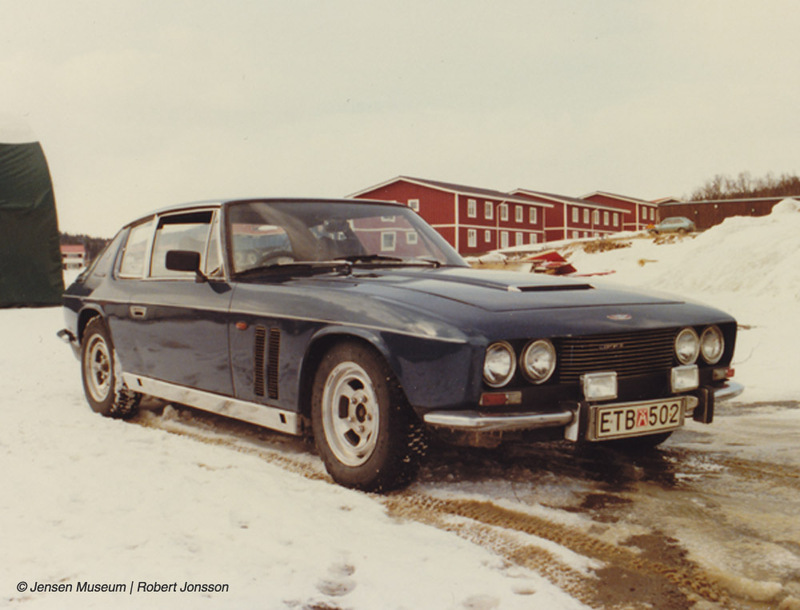 Jonsson was eventually caught in 1993 for his activities, but the result has been some confusion in regard to chassis numbering of Jensen cars in Sweden. Some of the cars in question remain to this day on incorrect chassis numbers. After being caught for his activities, Jonsson has tried to make amends, by helping to sort out the chaos he caused. As to 119/029, Jonsson must have become mixed up as to which car was which, and this led him, much later, to state he had scrapped that car after he had brought the car to Sweden. It was well into the 2000s before the truth emerged. 119/029 was surviving, but its identity had been changed to 119/020. 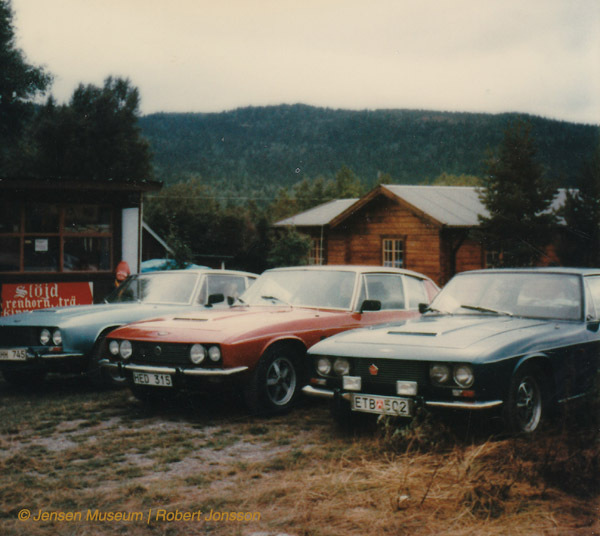 Three Jensen FFs photographed by Sten Jonsson in the early 1980s. 119/020, 127/219, and 119/029. That was their true identities, but by the time this photograph was taken, they were all on switched identities. Jensen FF 119/029 photographed in the early 1980s (1983 ?). By this time the car was masquerading as Jensen FF 119/020. 119/029 was largely forgotten, regarded as a non-survivor. Meanwhile the original 119/029 chassis plate which had been removed from the 541 S in 1998, ended up on another Jensen FF. 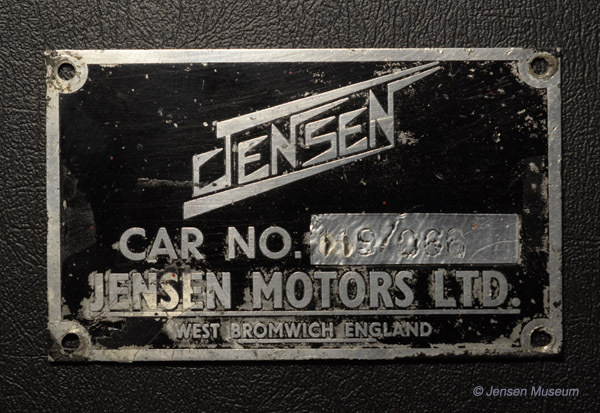 To add further confusion to the story, Jensen FF chassis number 119/130 had been registered as car number 119/066. Incredibly, the original 119/029 chassis plate, which had been removed from the 541S, found itself attached to 119/130. But now, a section of silver foil had been carefully placed over the car number panel, with the stamped number 119/066. It was only in 2016, when the then owner of 119/130 (masquerading as 119/066 ), finally managed to have his car registered with the Swedish authorities on its true identity of 119/130. He gave the supposed 119/066 chassis plate to the Jensen Museum for their archive. 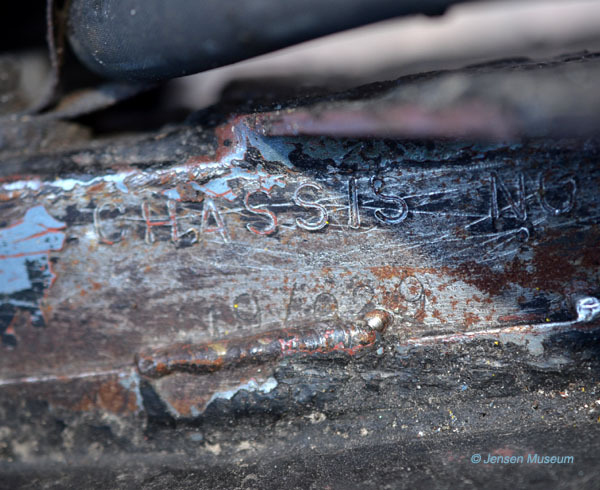 When Museum curator, Ulric Woodhams, looked carefully at the chassis plate , he found that a section of foil had been placed over the car number panel. Removing the foil, revealed the original 119/029 chassis number. The 119/029 chassis plate with foil overlay showing the number 119/066. The foil overlay carefully removed showing the genuine 119/029 number. Back in the earlier 2000s, Jonsson’s son, Robert, contacted Woodhams. 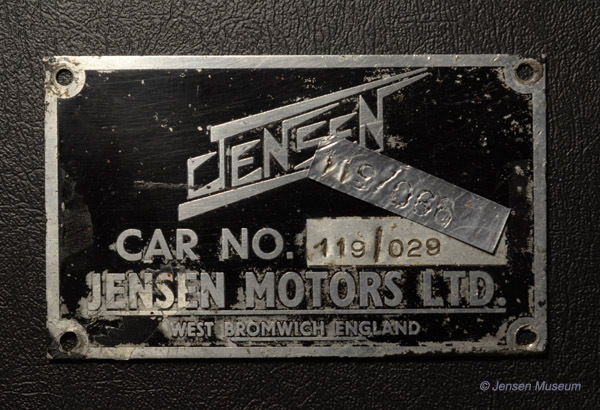 His father’s interest in Jensen cars had filtered through to his son, and it was largely down to Robert’s persistence, that led to himself and his father trying to help Jensen owners with cars on incorrect chassis plates. The story of the true 119/029 emerged. After bringing the rusty yellow painted 119/029 (now masquerading as 119/020) to Sweden, Jonsson did some welding work, and quickly painted the car dark blue. He then sold the car to an elderly local man, Ivan Erik Ingemar Lindholm, from Katrineholm. Lindholm liked to tinker on cars, but rarely drove any. 119/029 spent the next twenty odd years sitting in his garage. One would imagine the story of 119/029 couldn’t become more complicated – but it did. During 1998, the owner of the Jensen 541 S managed to have his car corrected to its original chassis number with the authorities. 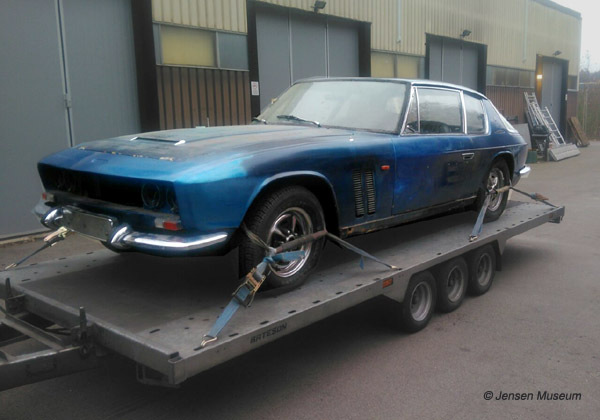 Meanwhile, Robert Jonsson had purchased the original Jensen FF chassis number 119/156. There was a problem however. 119/156 had not been registered with the Swedish authorities, and had been left off-road for many years before being purchased by Jonsson. 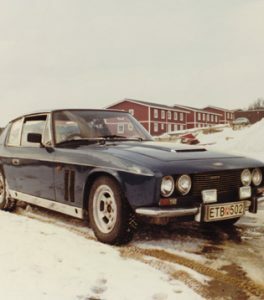 The 119/156 chassis number had previously been used on another Jensen FF, as such Jonsson could not register his car with the Swedish authorities with the 119/156 chassis number. So, when the then owner of the 541 S had managed to have his car registered under its correct chassis number, that freed up the 119/029 chassis number. Jonsson registered 119/156 with the Swedish authorities as 119/029. Although, by the time Jonsson contacted him, the original 119/029 chassis plate had been given to someone else. 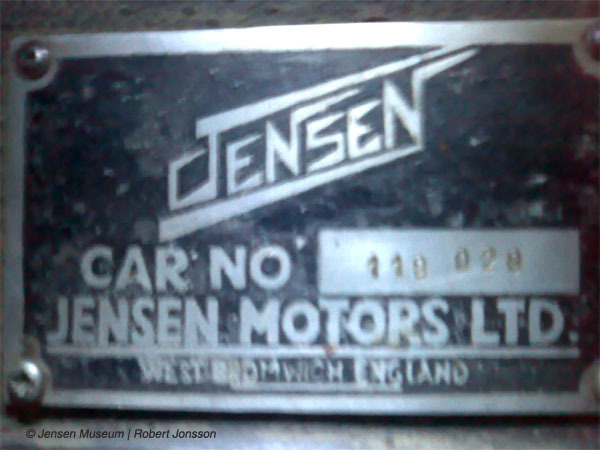 A replica Jensen chassis plate (screen printed not acid etched and infilled) bearing the chassis number 119/029 was fitted to Jensen FF 119/156. Photograph taken by Jonsson in the late 1990s. During 2011, Robert Jonsson had managed to make contact with the owner of the true 119/029 (masquerading as 119/020), Ivan Lindholm. Jonsson also made contact with the owner of the true 119/020, which was masquerading as 119/156. Jonsson by this time owned the true 119/156, so by bringing the other owners together, they could all agree to go to the authorities and have their respective cars registered correctly. It worked. Lindholm had his car, 119/029 registered correctly. As did Jonsson and the owner of 119/020. In May 2016 Dan Hakam Mikael Lindholm from Karlshamn purchased the true 119/029 from Ivan Lindholm. Although sharing the same rather common surname, the two men were not related. Neither of the Lindholms did much restoration work to 119/029, and the car remained largely how it must have looked when Ivan Lindholm bought the car from Sten Jonsson in 1983 or thereabouts. During 2017, 119/029 was advertised for sale. 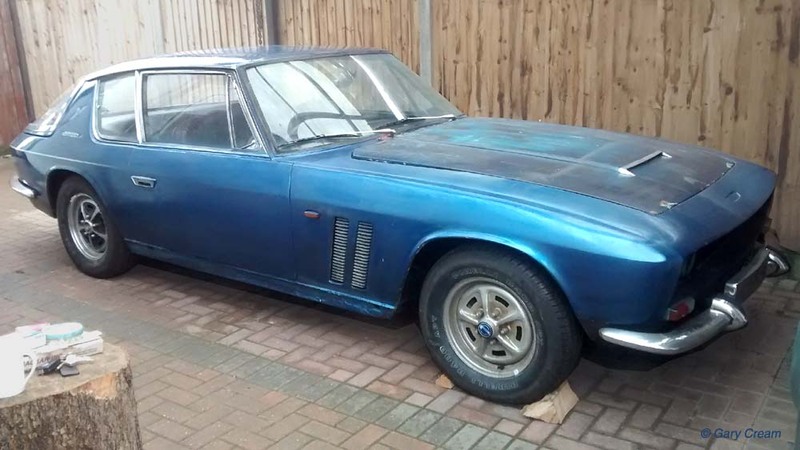 The car was acquired in November 2017 by a UK-based buyer, who was looking to add a Jensen FF to his collection. 119/029 aboard trailer in Sweden, and about to be brought back to England. Photograph taken in 2017. 119/029 photographed a few days after its arrival back in England. In December 2017, and prompted by the concerning historical background, the Museum was contacted to undertake a certification on the car. This would be an interesting certification, since Woodhams had viewed the car back in 1982, when Butler was selling the car. The inspection led to confirmation this car was 119/029. To Woodhams’ surprise, areas of the old yellow paint (last seen when the car was for sale in 1982) were still present once pieces of bright-work were removed. Even the original crystal blue paint was evident in unmolested areas – in fact the car was far more original, and structurally sound than Woodhams could have hoped for. The chassis leg of 119/029. Crystal blue paint was clear to see, along with the untampered number 119/029. The replica chassis plate bearing the number 119/029. Jonsson managed to bring the owners of 119/020 and 119/029 together. Their respective cars, along with Jonsson’s 119/156 were put onto their correct identities. Afterwards, the three men swapped their chassis plates over. Jonsson gave the replica plate 119/029 which had been on 119/156, to Lindholm. This plate still remains on 119/029 today (2018). 119/029 photographed in England late 2017. In fairy story style, it has been wonderful to reveal a happy ending for 119/029.